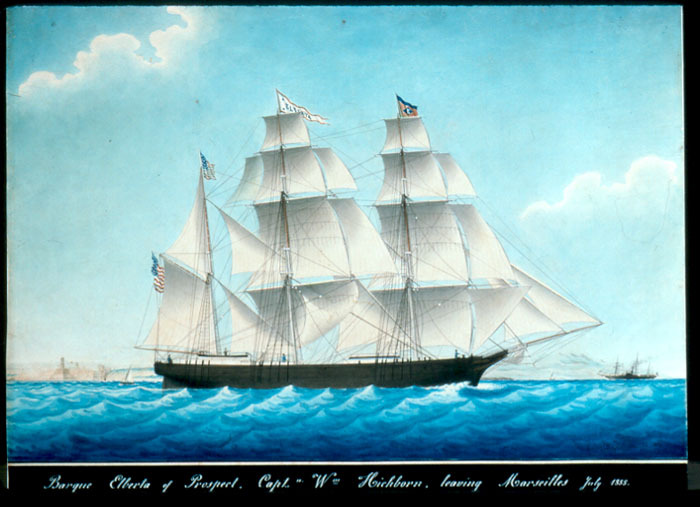 Marine painting featuring an accurate depiction of a vessel, usually commissioned by the owner or captain. in particular were not done for art’s sake or for collectors of fine art, but rather for buyers with a personal interest in the subject. Today we value both signed and unsigned examples for their unique history and their attractiveness. For people interested in maritime history, these works are sources of information about the past, as well as works of art. A religious painting commissioned out of thanks for delivery from a dangerous situation. were often commissioned by religious seafarers who were thankful after surviving maritime disasters. As artists moved away from religious and heroic paintings in the seventeenth century, towards painting the world around them, marine art flourished in the Netherlands. Hendrick Vroom (1566-1640), an important early Dutch marine artist, created commemorative paintings of Dutch and English naval battles and vessels. 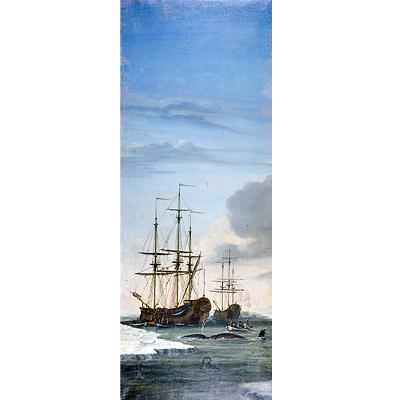 He influenced other artists in Holland, including the Van de Veldes, father and son, who emigrated to England in 1672 and influenced a growing school of marine art in Britain. Both Holland and England were sea powers, linked to the oceans of the world for their wealth, power, and food supplies. Their identities were tied to the sea. 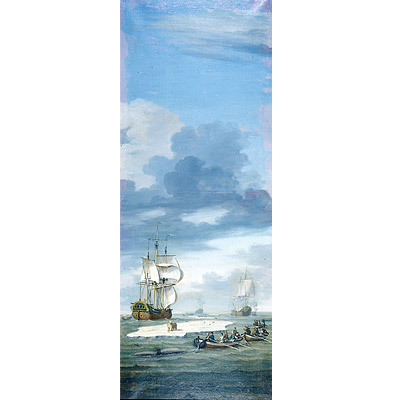 Seascapes reflected their maritime interests. 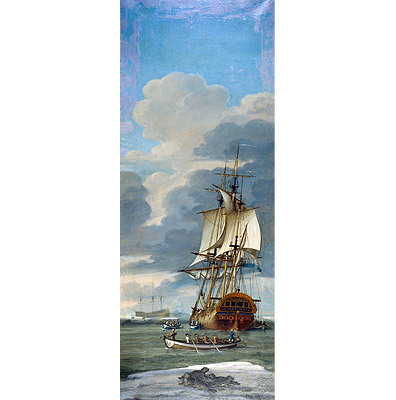 These paintings of the Greenland whale fishery by Joghem de Vries, done in 1769, show a highly developed Dutch marine art tradition. 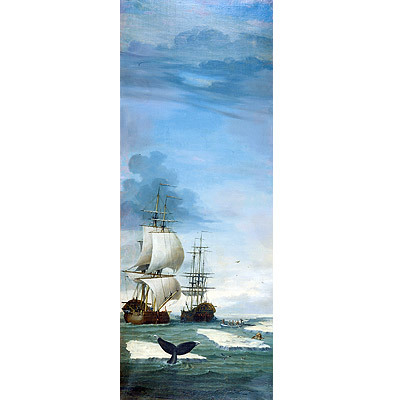 In the 17th and 18th centuries, the Dutch had a major whale fishery, and Dutch marine artists painted it. These paintings may have been designed for a house or hall. They are in pairs and could fit around tall narrow windows. The setting presents a complete view of the Greenland whale fishery, one that the artist must have seen. One of the museum’s founders purchased these paintings from the Hearst Collection in California. After his family left Searsport, they were in the whaling business and collected whaling art. 1. Short for logbook, a document required to be kept by merchant and naval vessels. In the log must be recorded specific information relating to the navigation of the ship, the organization of her crew, and other activities on board. Outer and two inner circles engraved on a nautical chart, used for laying off courses or bearings. Read More, and other nautical motifs. An artistically talented seafarer might progress to ship portraiture. During the period of the China Trade, when Mainers were sailing to ports in China, the Qing (or Ch'ing) Dynasty (1644-1911) was in power. The Qing Dynasty was established by the Manchus in northeastern China, and expanded to surrounding territories of Inner Asia, establishing the Empire of the Great Qing.Read more., and the Northeast United States. Penobscot Marine Museum has examples of ship portraits done in cities around the world. The Clarissa B. 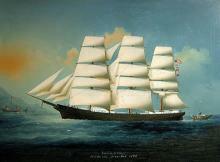 Carver, built in Searsport in 1876, was painted by an unknown artist in China. It shows the ship off Lintin Island at the mouth of the Pearl River, near Macao. The ship Nancy Pendleton (below) was painted in Bremerhaven, Germany, by Carl Fedeler (1799-1858). The Bark Elberta (below) of Prospect, Maine, was painted in Marseilles, France, by Joseph Honoré Maxime Pellegrin (1793-1869). Marie Edouard Adam (1847-1929) of Le Havre, France, is a well-regarded marine artist. 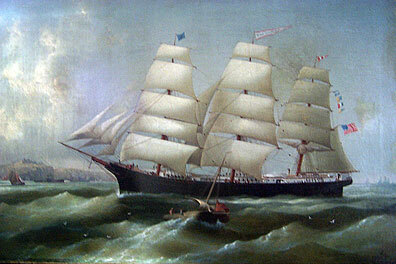 He painted the ship Oneida in 1877. The Oneida was built in Searsport at the McGilvery Yard, by master builder Marlboro Packard. She was built for Captain McGilvery and some partners, who sold her in 1888 for the Alaskan salmon cannery trade. Italian painter Luigi Renault (active 1858-1880) painted the barkentineMary Jenness entering Livorno (Leghorn), Italy in 1876. Captain George Harrison Oakes took the Mary Jenness on her first voyage down to New York, and there loaded and sailed her to Livorno. He was proud of the new ship, the 505 ton, 132’ product of his father Joseph’s yard in Brewer. He hired Renault to paint her. Renault was a good choice for he would be appointed marine artist to the King of Italy. The museum library has the journal kept by thirteen-year-old Margaret Oakes who sailed with her father on the second voyage of the Jenness in 1880.